FAQs | Welcome to Sesame International Preschool ! 1. What makes Sesame different from other schools? 2. Explain the principles behind Sesame’s curriculum. 3. How are such high learning expectations possible for small children? How can they learn these things when they don’t speak clearly yet? 4. What kind of school does Sesame Alumni typically attend? 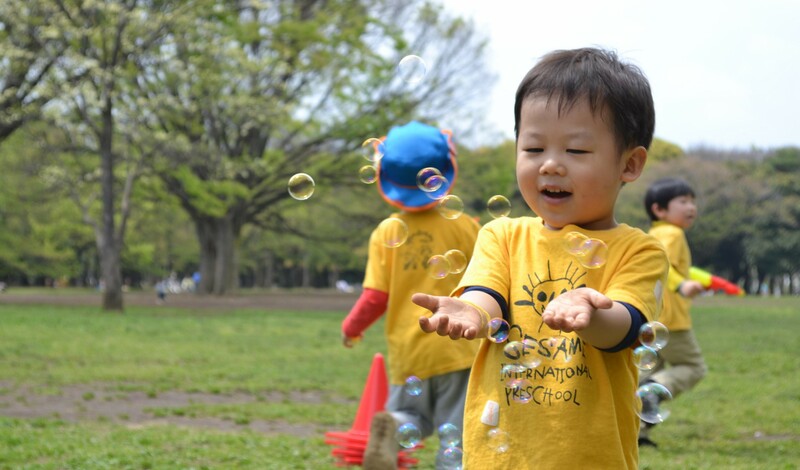 In Tokyo there are so many wonderful international schools available to choose from for your family’s needs. However, we at Sesame International have created a special situation, a “home away from home ” that not only will your child be nurtured and encouraged, but also you child will be given an exceptional educational opportunity. To help better understand what Sesame has to offer your family we have created this Q & A page to answer some of the most common questions we have received. Answer: First and foremost, what sets Sesame apart are our kind hearted teachers. Almost all of our student’s parents comment on the home-like feeling of our school setting and the loving care of the staff here. But more than just the care given, we offer a curriculum unlike any other school. We believe that children are only limited by a lack of experiences and benefit most from an increase in opportunities. With that in mind, we include learning topics such as Science, Art & Music Appreciation, Physical education, Cooking and various Fun Days to enhance their knowledge and school experiences. Even our youngest students learn about flags from around the world and look at works of the Masters! Art & Music Appreciation, PE, Cooking and Fun Theme Days. because the children are enthusiastic about learning and sincerely look forward to learning. that attitude stays with them for their lifetime. Learning is fun and that opens the possibility to reach for the stars! Answer: Sesame Alumni typically attend the following type of school. 1. I have a 2 year old, how would they learn about the Masters in the classroom? 2. How many days do children typically come to Sesame? 3. What are your admissions requirements? Do you accept Japanese children? 4. What age are your students? Answer: We offer a full-range of programs to include an age range from 6 months (Baby Class) to ten years old (Advantage Classes), with the majority of our students from 1 years old to 6 years old in our main preschool program. For more details, please check “Class” and “Other programs”. 5. Do you offer a school lunch program? 6. In your school, what dialect of English do you use? Answer 1: Predominately we teach in an American English dialect, however because both our teachers and students are from a variety of different backgrounds, we sometimes use different dialects of English and highlight these differences to our students. In the world not everyone speaks with the same dialect, so we hope to have our students experiment and experience all dimensions of the language. Answer 2：As another example of the specialized care we offer at Sesame is our school lunch program. Since we are a small private school we are able to offer special lunch menus for those students who have specific dietary needs or requirements due to allergies or their religion. Answer 3: We do not limit spaces for foreign or Japanese students, but at the same time we strive through our recruitment to maintain a true international setting whereby many countries’ citizens are represented. Our mission statement reflects our sincere desire to have a student body that reflects the world we live in because we believe that when children interact with children from other countries and make friends, we all benefit. Answer 5: In our classrooms, children learn about the Masters in many different ways. For example, to initially introduce an artist’s works a teacher may use cards or posters. Then students “talk” about what they see. Points are as basic as, ‘what colors do you see?’ ‘What season is it?’, and making up a story that matches the picture. Then the child will learn about the artist, what their name was, where and when did they live, ans interesting facts about their lives and interests . (We are able to link our other weekly topics with each other by this method as well. For example, an artist’s origin is connected with our topic for Geography Day). We base our planning for these topics on artist’s birthdays. Wouldn’t it be great to share a birthday with a famous artist, such as Michelangelo? (March 6th, by the way) What an inspiration for a child’s sense of self! Parents English Lesson “AWESOME ENGLISH” starts from January 2019! Copyright © Welcome to Sesame International Preschool !